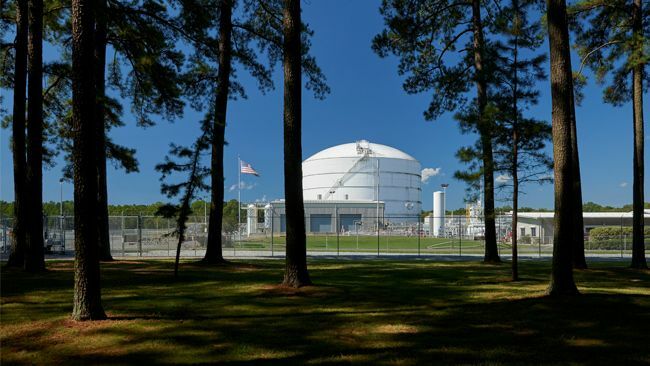 Duke Energy subsidiary Piedmont Natural Gas announced on Friday plans to build and operate its fourth liquefied natural gas (LNG) storage facility to increase reliability during peak demand times. Piedmont estimates the Robeson County, North Carolina project will cost $250 million and expects to begin construction in the summer of 2019 and begin operation in the summer of 2021. Frank Yoho, president of Duke Energy's natural gas business, said the facility is needed to serve peak demand in the face of rising costs for pipelines to secure access to emergency supplies, according to the Charlotte Business Journal. The facility, meant to contain 1 billion cubic feet of natural gas, will be able to serve 100,000 homes, Piedmont spokesperson Loree Elswick told The Robesonian. The project is independent from the construction of the Atlantic Coast Pipeline, Elswick told Utility Dive. The storage facility will be catering to Piedmont's home heating customers, as opposed to commercial customers or utilities, helping to heat residences during winter days of natural gas peak usage. Piedmont looks to the natural gas facility as a way to ensure reliability during days of extremely low temperature. Locating the facility in Robeson "frees up natural gas on the rest of our system" during peak cold days, Elswick said. Piedmont already owns and operates two other LNG facilities in North Carolina and a third in Nashville, Tennessee. "These are needs-driven projects," Elswick said. Last month, a report from the Rocky Mountain Institute emphasized opportunities to reduce annual carbon emissions nationwide by 10% through electrifying heating for residential and commercial customers. Duke Energy continues to invest in natural gas infrastructure, Yoho said in a statement. Duke acquired Piedmont for $4.9 billion in 2016, adding 1 million gas customers to Duke’s base. While the new LNG project will not be impacted by the construction of the Atlantic Coast Pipeline, Elswick said the facility will be able to choose based on cost between purchasing natural gas from the new $6 billion pipeline from West Virginia and the existing Transcontinental Pipeline, which brings gas from the Gulf coast. Duke Energy and Piedmont are both project owners on the Atlantic Coast Pipeline, along with Dominion Energy and Southern Company Gas.